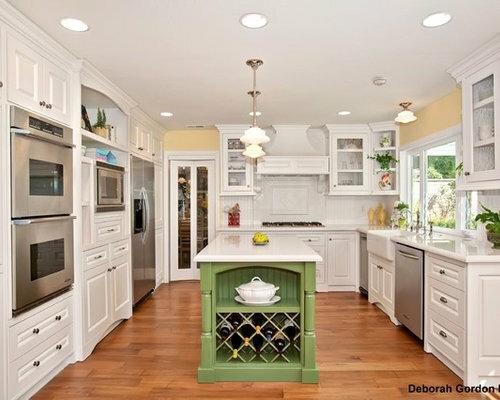 This homeowners’ dream has always been to have an all white, French Country kitchen. Her original floor plan was not as open as the new one. 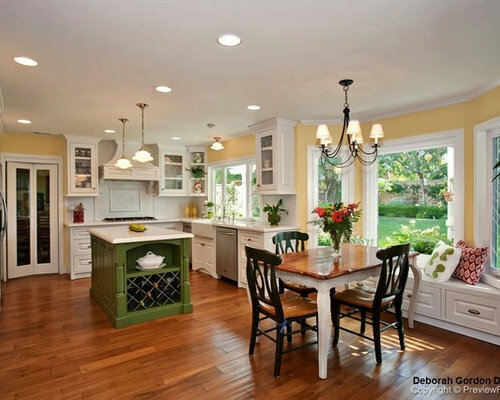 It included a large peninsula and upper cabinets that blocked off the view and flow into the breakfast nook and family room. The new space plan eliminated the peninsula that divided the two rooms, incorporating a large, center island, bench seating in the breakfast nook and furniture style cabinetry throughout. The ceiling was raised by six inches, removing an unnecessary soffit and creating an overall bigger space. All of these new elements created one large great room that has better flow, and a crisp, clean, light palette throughout the space. The perimeter of the new kitchen features much more counter space, with stunning Ceasarstone quartz counter tops that are reminiscent of marble, but is maintenance free. The backsplash is a combination of white bead board and an all white mosaic tile surround over the range and custom hood. The white Porcelain tile has a subtle design, reminiscent of something in an old French country home. Every drawer and cabinet for this kitchen was created for a specific purpose as the homeowner is an avid baker and requested specific storage for items like a sprinkles draw, a pie utensils drawer and more. Additionally, the homeowner requested display areas for her collected treasures. So the space was balanced with the necessary storage for a functional kitchen and the decorative display units appropriate for a great room. 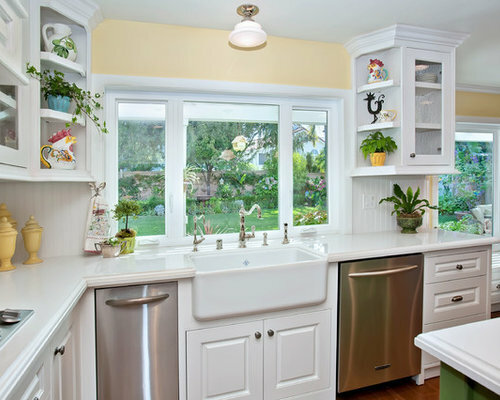 The apron style sink and Rohl Faucets truly bring this kitchen into the French Country side. The high-end finishes and traditional detailing offer the occupants so much to look at. To add visual interest, the room is centered around a custom, furniture-style island that was created in a dramatic sage green to accent the warm, rich wood floors and the white perimeter cabinetry. Altogether, this space is inviting, warm and just what the homeowner asked for.